If you have just sat through the session I hope it has been useful and has given you some food for thought! Perhaps even some ideas for trying out in your main placement school. Above is a copy of the powerpoint materials used and below are the promised links to help you follow up some of the ideas that we have discussed today. Getting Started with a Website – To help get you started I have put together an overview of 10 things to start thinking about when setting up a website (it is a .pdf file and will require Adobe Acrobat). The links in the leaflet can also be accessed directly here. For a detailed overview of the presentation including further links – see the electronic handout I produced when I first presented a similar session to this at the SAGT 2007 conference. Also use the page links at the top of the blog to explore other uses of new technologies – for example Interactive Whiteboards. As we continue to make more use of the technology that more and more of our students have access to, such as the internet, mobiles, social networking sites, blogs etc. it is important that as well as using these technologies to support the education of our students that we also educate our students on the responsible use of these technologies! On the one hand we need to promote and encourage student creativity in the use of online technologies but we also need to them the ‘rules’, it is acknowledged in the literature on this that the rule of thumb is, if it is not acceptable in the physical world it is not acceptable in the virtual world. Whilst in school, students are to a greater extent protected by the safety of school and county filtering systems, most of our students use of online technologies takes place outside of school and often not within an educational context, for example use of messenger or social networking sites with friends. It is therefore important that if we are to utilise these technologies in achieving our educational aims and objectives we ensure that we teach responsible use and raise awareness amongst students of the potential dangers and how they can be minimised or avoided through responsible use. What are the benefits and risks of weblogs? Finally we also need to encourage students using online materials to give consideration to the plausibility / accuracy of the information posted and to teach students how to use material selectively, appropriately and making use of referencing to acknowledge sources that are used. The first of these resources “Coming of Age: Introduction to the new world wide web” is a superb free booklet (edited by Terry Freedman) packed with case studies on the use of emerging web 2.0 technologies such as blogs etc.. and including the thoughts of teachers / consultants on the use of these new technologies and how pupils respond with consideration given to case studies. Coming of Age 2.0 – the second edition of the booklet which is set to be an even weightier tome with a wealth of new case studies and ideas related to emerging technologies is due for release shortly. A “Coming of Age” ning has been set up as a discussion area for the booklet and anyway wishing to discuss the potential of exploring the use of web 2.0 tools can join. This is a 179 page directory of weblinks and resources that I have put together to support the teaching and learning of geography. It has been compiled from a variety of sources, including personal research, links from colleagues and suggestions / recommendations made by fellow geography teachers on the SLN forum. The directory can be accessed as a downloadable .pdf file in which all links can be accessed directly by clicking through from the interactive .pdf file (Adobe Acrobat is required for this). Due to the transient nature of the internet and the length of time taken in compiling this directly, unfortunately it is likely that there may already be some ‘dead links’, please feel free to e-mail me if you find any! 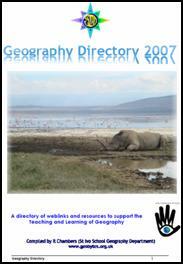 I am hoping to update the directory for release of a second edition sometime in 2009. The directory can be downloaded directly from the GeoBytes Website and can also be found on the resources section of the Geographical Association website. Please feel free to email me or leave comments here if you have any further questions on anything covered during today’s session or if you would like any further information on anything shown during the presentation. www.ictacrossthecurriculum (my AST blog -designed to support staff and build confidence in the use of ICT in teaching and learning in the 21st century classroom – this is added to fairly frequently and has lots of ideas for using ICT in the classroom – including training materials for the use of SMARTboards). GeoBytes – AS/A2 Online Learning Community (examples of VLE pages – some of these are login only and are for students at St Ivo – some pages are public) – this was set up as a trial for VLE use in the 2005-2006 academic year. (the department are looking to re-develop this to coincide with teaching the new AS/A2 specifications for teaching in September 2008). GeoBytesGCSE – a blog to support the OCR A GCSE course – a post is added for each key concept with a summary of key ideas and links to background reading, animations, videos, presentations and revision materials where appropriate. In my AST role I am starting to look at how new technologies can be used to support revision and I am hoping to run a session at school on my findings in April for those who are interested. As I research I am going to try and blog about as many potential tools as possible to. Mind mapping can be a great study aid for students, mapping out key concepts of a particular topic and exploring their understanding of key issues. 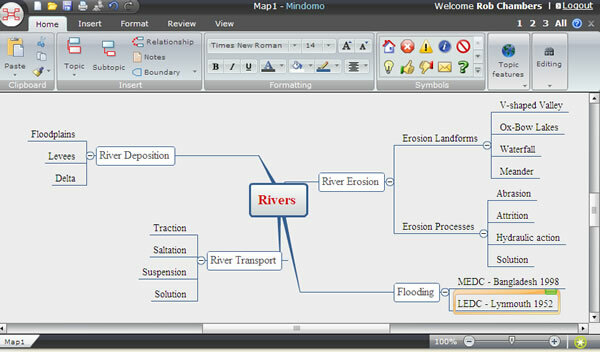 Although there are various options, Mindomo is a particularly good online mind-mapping tool. I think this holds great potential for some active and indeed interactive geography revision, with multmedia used to bring to life the concepts mapped out. I have had a quick go at mapping out some river concepts (see screenshot below) and am hoping over the next week or two to explore the multimedia options available. Many thanks to Andrew Field of Content Generator and Effective ICT for sharing his fabulous presentation “40 ICT ideas in 40 minutes” – some great ideas here…. lots of food for thought! To follow comments / ideas related to the presentation see this thread on the Effective ICT forum. “Climate Change in Our World is the product of a unique collaboration between DFID, the Department for Environment, Food and Rural Affairs (Defra), the Met Office Hadley Centre, the British Antarctic Survey and Google.” There is a great little video clip here, which demonstrates the use of the new Google Layers showing the climate change data and the impact. A new resource definitely worth exploring for use in teaching climate change in the new specs. Jane’s E-Learning Pick of the Day seems to be an excellent way of keeping up to date with e-learning tools and ideas. Updated on a daily basis with suggested links and ideas to support e-learning. Written by Jane Hart of the Centre for Learning and Performance Technologies. Certainly one to keep an eye on – and I’ve added it to my blogroll!! Thanks to Val Vannet for letting me know about this one. This morning we were talking about the Geography Presentations group on slideshare in which staff can share powerpoints. I have now remembered the address (my apologies for earlier) and you can access the presentation group here. Enjoy! I have also made the link below active for people to download my guide for setting up a WordPress Blog. Today (Thurs 20th March) I have been working with trainee Geography teachers at Homerton College, Cambridge, exploring the use of new technologies in enhancing the teaching and learning of geography. My seminar is based on that I gave at the SAGT conference back in October 2007 and I have been exploring the use of websites and Web 2.0 technologies. If you have just sat through the session I hope it has been useful and has given you some food for thought! Perhaps even some ideas for trying out in your main placement school. Below are the promised links to help you follow up some of the ideas that we have discussed today. For a detailed overview of the presentation including further links – see the electronic handout I produced when I first presented this at the SAGT 2007 conference back in October. Also use the page links at the top of the blog to explore other uses of new technologies – for example Interactive Whiteboards. Please feel free to email me or leave comments here if you have any further questions on anything covered in the conference seminar or would like any further information on anything shown during the presentation. 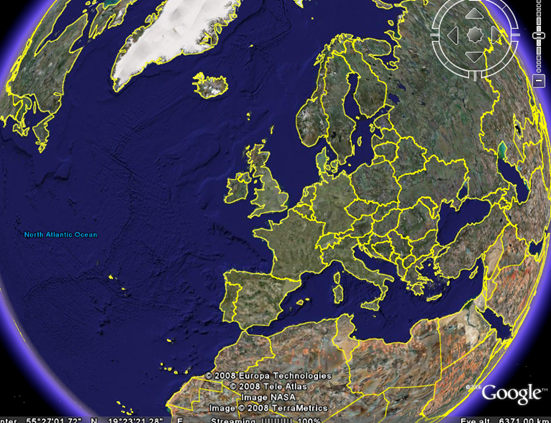 GeoBytesTravelandTourism – a new blog, very much in its initial stages set up to support AS/A2 Travel and Tourism students following the Edexcel AS/A2 single and double award.